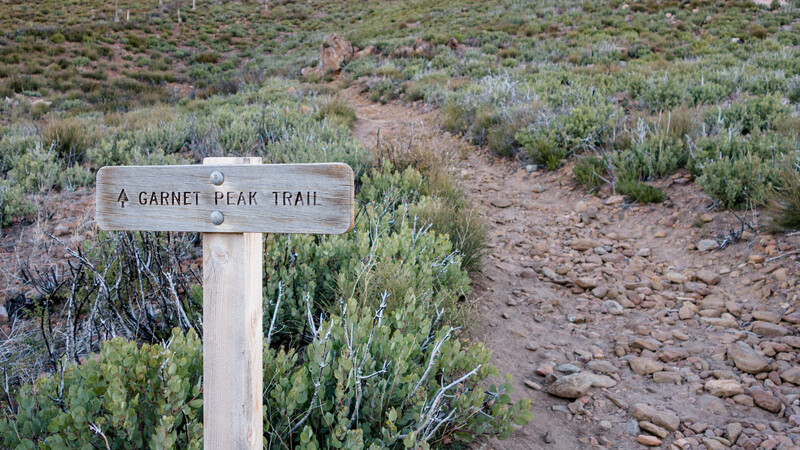 Garnet Peak is just off the Pacific Coast Trail on the northeastern edge of the Laguna Mountains. At 5900’ in elevation, it sits at number seven on the Sierra Club’s list of the 100 highest peaks in San Diego County. I set out early for Garnet Peak with the hope of reaching the summit in time to catch the sunrise over the Sawtooth Moutnains. I had heard stories and seen pictures, and this was one opportunity I didn’t want to miss out on. Despite my best efforts to get an early start, I managed to arrive at the trailhead right at sunrise, which meant a summit sunrise was out of the question. Even so, the early morning hike and views from the summit would not disappoint. From the trailhead on Sunrise Highway, I headed northeast on the flattest section of the Garnet Peak Trail. After about two-thirds of a mile I crossed the Pacific Crest Trail. I had hiked small sections of the PCT in Yosemite and in Southern California, but this was my first time crossing its path in San Diego. As I crossed the PCT I thought about all the thru-hikers who had spent months of their lives travelling its 2600 mile course from the Mexican to Canadian borders. How many of them had taken the time to make this short trek up to Garnet Peak, and how many were yet to come? 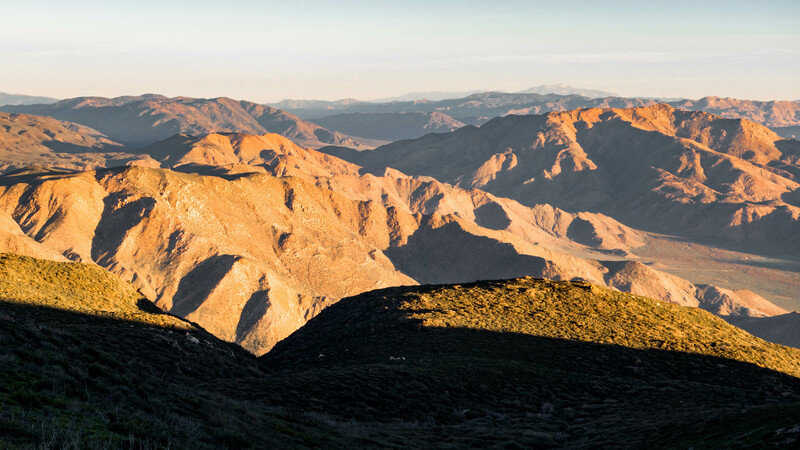 After shooting a few pictures, I picked up Garnet Peak Trail again and started hiking the second remaining two-thirds of a mile to the summit. It didn’t take long before the views opened up from the trail and I felt the anticipation building. The sun was rising quickly and I wanted to get to the summit before bright morning light washed out the desert mountains. I reached the rocky summit just as the sun had broken free of the horizon. There was a couple sitting on the edge looking out over the desert and taking in the golden warmth of the sun. I greeted them as I passed and took a spot on the south end of the summit, worked my way toward the edge and found a spot to enjoy the view. My timing was perfect. 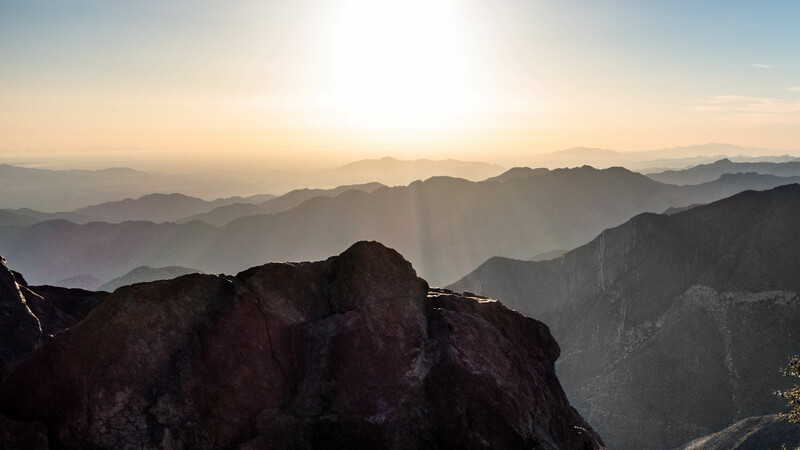 The sun was sitting in the distance just above the eastern horizon offering a silhouetted view of the Sawtooth Mountains for as far as my eyes could see. Nearby, I could see the neighboring summits of Garnet Mountain and Monument Peak. 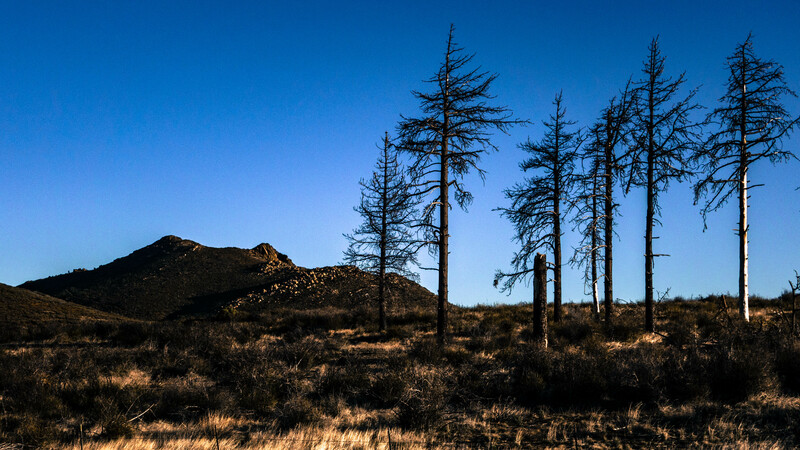 And looking west towards Cuyamaca, Stonewall and Cuyamaca Peaks stood tall behind the pine tree covered summit of Pine Mountain. After spending a few minutes taking in the moment and enjoying the views I set out for my return trip following the same route along Garnet Peak Trail back to the trailhead. I just hiked this day before yesterday on a camping trip in Burnt Rancheria. It was hot and the gnats were kind of bad at the top, but the view was very worth it! It’s that time of year, the bugs are out in abundance. I’m glad you enjoyed the hike. Thanks for sharing!